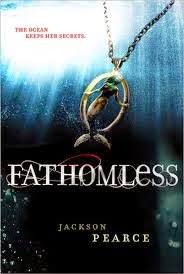 Review: This is loosely based on the Little Mermaid and while I didn't read the first two books of the series, I was excited to dive into this one. Told in alternating narratives, we follow Celia, Lo and later Naida (Naida was Lo before becoming a mermaid, kind of like two souls in one body or multiple personalities). I really enjoyed all of Celia's sections, including her relationship with her sisters (Celia is trying to establish an identity away from them and they aren't happy about it) and her budding romance with Jude (it was very sweet). The Lo/Naida sections were interesting when she was interacting with Celia, but whenever she went underwater to be with her mermaid sisters, I lost interest. Mermaids in this book loose their human memories quickly and basically float around for years until they become angels (that is what they believe anyway). I wasn't expecting a kingdom underwater, but there really wasn't too much going on down there. Other than slightly discolored skin, mermaids don't differ from my humans physically (no classic mermaid fin). Since they don't have memories and there isn't much to do other than braid each other's hair, underwater life was pretty boring. Overall-I enjoyed this and the ending was pretty good. I plan to read the other books in the series at some point.